Powder Room: Toni and Dan hang with the kids at The French Room. Tom Ford Quilted Faux-Fur Puffer (Toni’s own), Erin Snow Zuma pant ($498), Bogner Lech-T jacket ($1,600). Just 8 miles down the road, Snowmass has always been the Jan to Aspen’s Marcia. But a $600 million upgrade, which will be phased in over 10 years, hopes to change that. 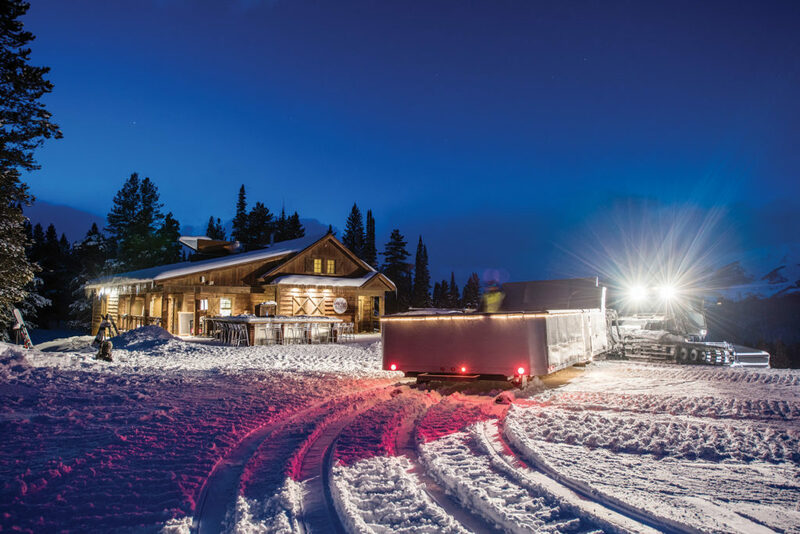 This winter marks the opening of the new Snowmass Base Village and the luxury Limelight Hotel. At the ice skating rink, keep an eye out for the roaming s’mores carts (they look like oversize marshmallows). They’ll have a special flavor on Valentine’s Day. Casa Tua. “It’s like going to Italy with the homemade spaghetti and noodles, and one of our closest friends runs the place. They usually have amazing music going on across the street at Belly Up Aspen, too.” 403 S. Galena St. 970-920-7277. Pine Creek Cookhouse. 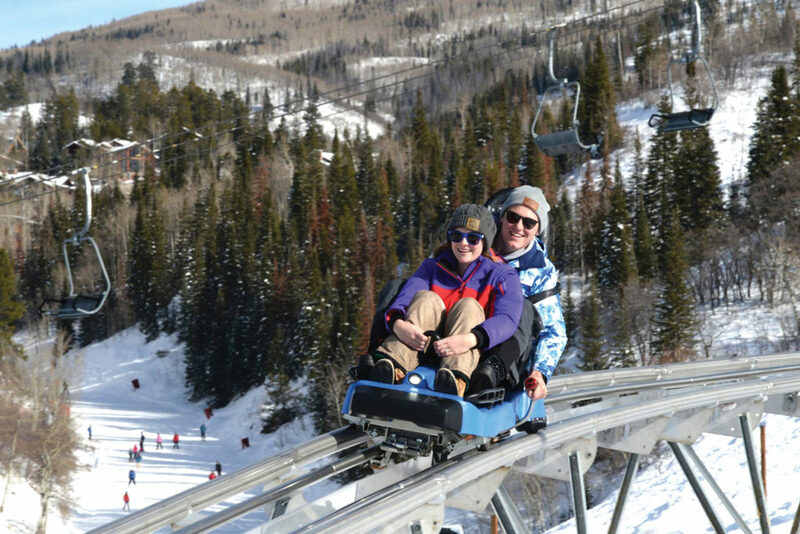 “They have sleigh rides that they do out to the restaurant, which has the most beautiful view of the Maroon Bells. They use a lot of game, like elk and venison.” 12500 Castle Creek Rd. 970-925-1044. CP Burger. “In the summer, CP Burger is kind of like a mini-golf. And in the winter, they turn it into an ice skating rink, so you can have burgers and watch the kids skate. It’s really cute.” 433 E. Durant Ave. 970-925-3056. O2 Aspen. “They have yoga there. And the most amazing CBD massages. And not to worry, you don’t get high from it or anything. I hope not. I mean, who knows, I feel great after them.” 408 S. Mill St. 970-925-4002. The Little Nell. “When we travel, I like to have a kitchen so it feels like home. So the Residences at The Little Nell are a great place to stay. The atmosphere is so warm and cozy, and they have the best hot chocolate.” 501 E. Dean St. 855-420-9009. S’more fun: Johnny and Carley stock up on provisions at Royal Blue Grocery with sons Ernest and John Jr. Obermeyer Mach 9 jacket ($200), Obermeyer Allemande jacket ($150). Snowshoe or ski from Crested Butte Nordic to the Magic Meadows Yurt, where you’ll be rewarded for your effort with a five-course meal by chef Tim Egelhoff ($135 per person). Or put on your best faux fur and take a sleigh ride up the mountain to Uley’s Cabin and Ice Bar for a five-course prix fixe dinner ($110 per person; Valentine’s Day dinner is $150). Secret Stash Pizzeria. “Secret Stash is a must, must, must do. They are famous for this pizza called the Notorious F.I.G. with fig and prosciutto.” 303 Elk Ave. 970-349-6245. The Dogwood. “I haven’t had a cocktail in Dallas as good as anything there. They have a drink called the Rosebud, and one called the Beetnik. It’s just a treat. And it is in this quaint, really tiny cabin.” 309 Third St. 970-349-6338. The Slogar Bar & Restaurant. The restaurant and tavern was built in 1882 to serve miners coming home from work. Some of their recipes, including their famed skillet fried chicken, have been the same for more than a century. 517 Second St. 970-349-5765. Pooh’s Corner. “I’m 43, and this toy store has been there in the same spot my whole life. That is still the thing to do—go and get a toy for $5.” 302 Elk Ave. 970-349-6539. Off-Piste: Kameron and her kids, Hilton and Cruise, take a snow day in Klyde Warren Park. Bogner Phili jumpsuit ($1,670), Perfect Moment Queenie jacket ($290), Spyder Leader jacket ($179). 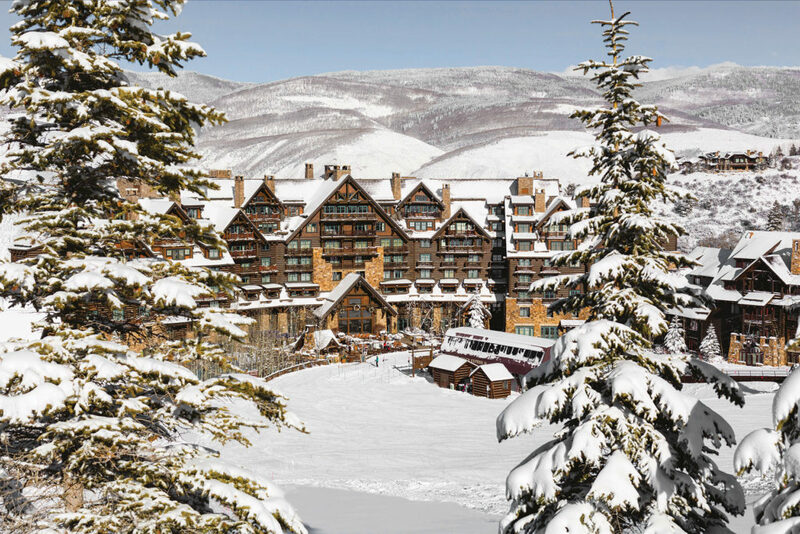 The Ritz-Carlton Bachelor Gulch was once the site of Court and Kameron’s courtship. This winter, the resort is upping its romance game. 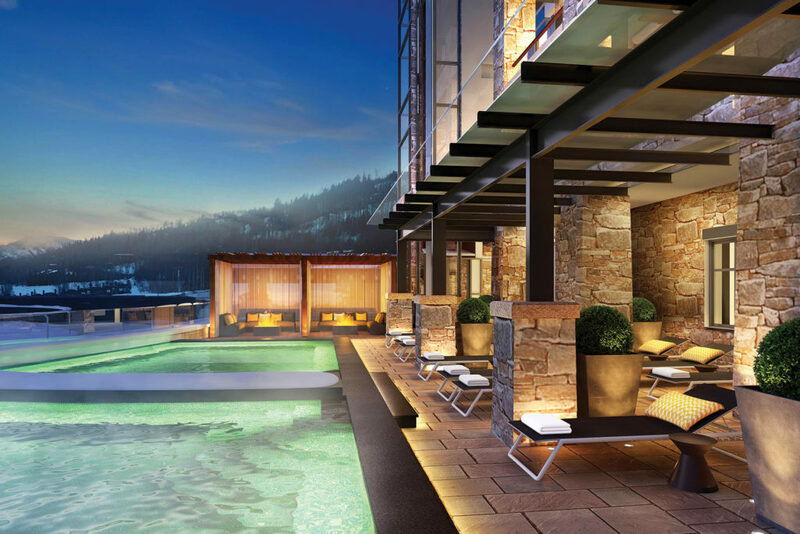 An après-ski Moët & Chandon Champagne and raw bar is debuting on the mountain-​facing outdoor terrace. In February and March, Wyld will host two winemaker’s dinners (the reservation-only experience is limited to 30 guests and includes a welcome reception, winemaker talk, and four-course paired dinner). But the pièce de résistance is a private dinner in the woods at Anderson’s Cabin, once the home of John Anderson, one of the seven bachelors of Bachelor Gulch who first settled in the area. Mirabelle at Beaver Creek. “It’s an old, little house, and it was turned into a restaurant. You literally feel like you’re having a home-cooked meal. It’s real cozy and private, and there aren’t many tables. I love it, but Court hates going there.” 55 Village Rd. 970-949-7728. Park Hyatt Beaver Creek Resort and Spa. 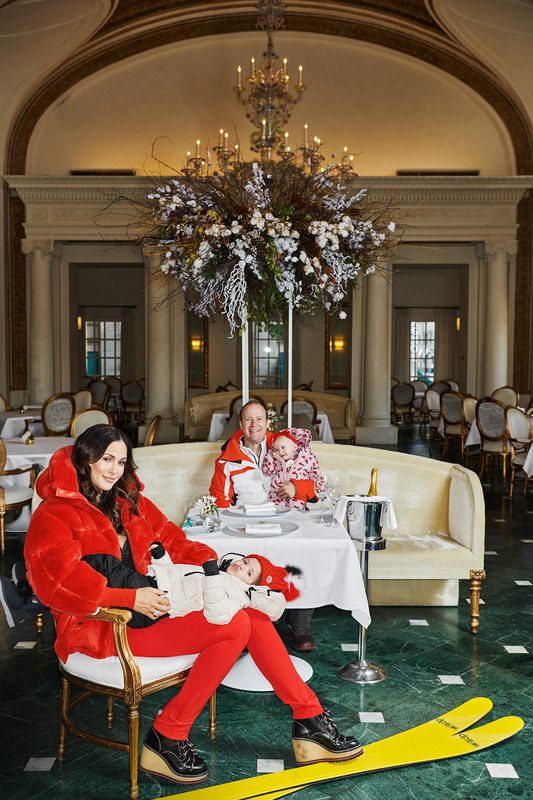 “I love going to the Park Hyatt and sitting at their outdoor restaurant, 8100, having a hot chocolate. That’s the best place to do lunch, because it’s great people-watching. They have this big bonfire always going, and they do s’mores in the afternoon. The kids love that.” 136 E. Thomas Pl. 970-949-1234. Gorsuch Beaver Creek. “They have home products, and they have amazing ski gear. We do our ski rentals there, and they have beautiful clothes to wear out for dinner.” 136 E. Thomas Pl. 970-949-7115. 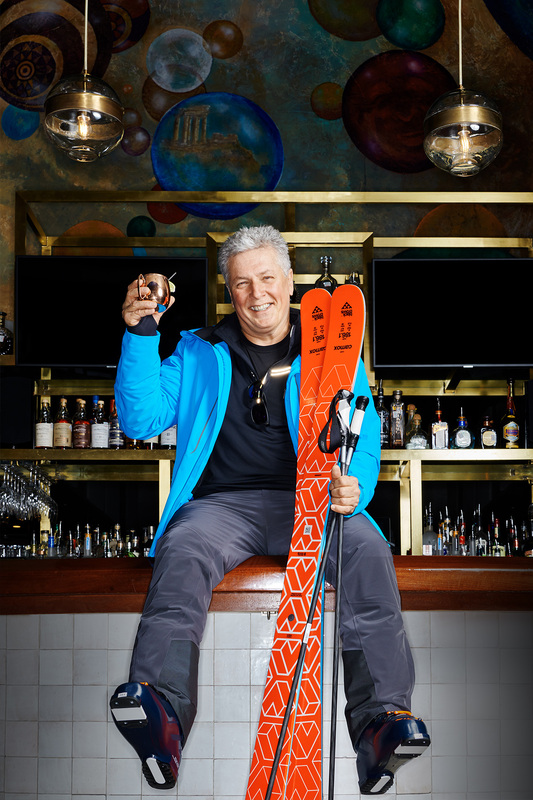 Pole position: Al Biernat atop the bar at his eponymous restaurant, which can trace its roots to a one-way ticket to Aspen. KJUS Boval jacket ($799), Black Crows Camox skis ($700). How I went from ski bum to steakhouse entrepreneur in four seemingly random steps. I went to Aspen one time on a high school senior trip and fell in love. Growing up in Michigan, everybody likes the winter sports. We would ski anytime we could and dreamed of living in a place like Colorado. I graduated when I turned 18. I had about $300 in my pocket and a one-way ticket to Aspen. I landed and hitchhiked into town. I got a job first at a lodge in Aspen called the Holland House. It was a beautiful lodge at the base of Lift 1A. Holland House was very international. The man that owned it was from Holland, and he built the lodge himself. He spoke eight different languages and all the people that would come were mostly just return guests year after year from all over Europe and the United States. It really didn’t pay much. We had room and board and $50 a month, but, you know, we were ski bums. We skied every single day. I was underage for working at a bar, but I ended up getting a job at The Paragon Ballroom and Oyster Bar, which was the hottest concept in town. It was a discotheque, and in the back was an oyster bar, and on the other side was like a parlor. Aspen back then in the early ’70s was a scene. Everybody was there, because it was a serious ski town. The oyster bar was where all the ski racers would hang out. I used to open about a barrel of oysters a day from the Chesapeake Bay area. We sold about 500 bluepoint oysters a night. We used to open up the oysters and serve daiquiris and, you know, all kinds of Champagne. It was just packed every single night, and I fell in love with the business. That’s how I got into it. Moguls: Brandy Minick and Greg Brown, publishers of Dallas-based Cowboys & Indians magazine, at Whiskey Ranch in Fort Worth. Descente Rachael fur jacket ($750), Helly Hansen Garibaldi jacket ($450). 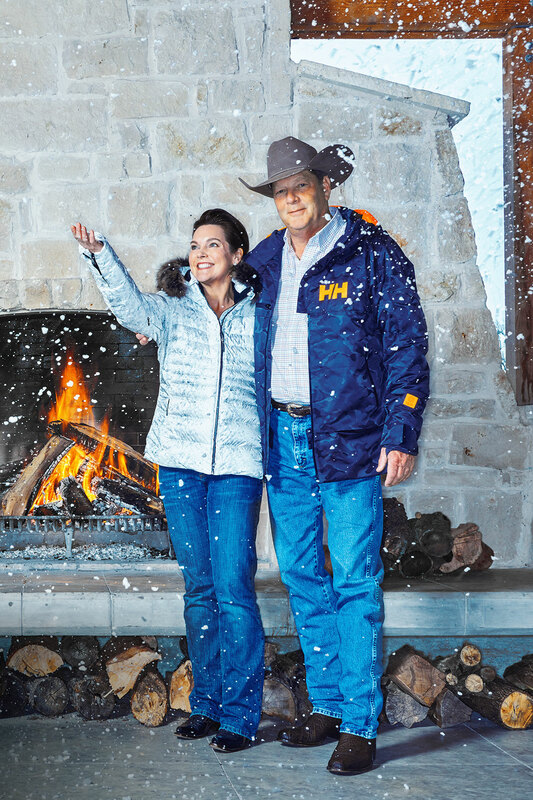 Brandy Minick and Greg Brown are the Western power couple behind Dallas-based Cowboys & Indians magazine. Brandy, the magazine’s current associate publisher, also happens to be a former team roper. Greg, the magazine’s owner and publisher, is an honorary member of the Cowboy Artists of America. For their second ranch outside of Tarrant County, the couple was looking for a mountain respite from the Texas summer heat. They found the perfect place to hang their Stetsons in Steamboat Springs. For more slopeside thrills, check out Steamboat Resort’s Outlaw Mountain Coaster, the longest coaster in North America at 6,280 linear feet. And keep an eye out for Taco Beast, the new roving snowcat serving street tacos and cervezas on the mountain. Ore House at the Pine Grove. “Ore House is one of our favorites. It has been in Steamboat since the 1970s. They have great steak and fish. It’s just a great Western atmosphere.” 1465 Pine Grove Rd. 970-879-1190. Mazzola’s Italian Diner. “Everybody knows Mazzola’s. You can’t even get into it. It’s underground and kind of dark, but it’s a staple in Steamboat with great Italian food.” 917 Lincoln Ave. 970-879-2405. Saddleback Ranch. “Saddleback Ranch is probably my favorite thing to do in Steamboat in the winter because I don’t ski. They built a mountain that you can actually take tube rides down. You can take a wagon ride pulled by horses to this beautiful lodge with a stunning view for a steak dinner. The couple that owns it has had that ranch in their family for years, and they live and work on that ranch.” 37350 RCR 179. 970-879-3711. Wild Plum Market. “This little grocery store on the mountain has ridiculously good food. It’s a total hidden gem that not a lot of people know about quite yet.” 2525 Village Dr. 970-879-1981. Pipe dreams: Marc Hepburn, a commercial pilot and current president of the Dallas-based Texas Ski Rangers, taught himself to snowboard on a National Brotherhood of Skiers retreat. The ski togs are his; the plane is borrowed. The biggest news of the ski season isn’t the Taco Beast at Steamboat Springs. It isn’t even in Colorado. It is the new private jet service from Dallas Love Field to Taos Ski Valley. The resort purchased a 30-seat Fairchild Dornier 328 so you can skip the TSA lines and board at the Signature Flight facility at Terminal 3 at Alpha 3. The price of your ticket includes demo skis or a snowboard, and the resort will send a shuttle to pick you up on the tarmac in Taos. Flights leave every Thursday, Saturday, and Sunday through March 31, and start as low as $358 round-trip. Dallas’ African-American ski club, the Texas Ski Rangers, first came into being over plates of chicken-fried steak and squash casserole at the Highland Park Cafeteria, back in 1984 when the restaurant was in Sakowitz Village in Addison. Willie Jackson, the club’s original treasurer, jokingly described the group at the time as “an upscale social club of professional snobs.” Although they hosted Leather and Lace fundraisers at the Hilton Anatole to support black youth with Olympic ski potential, the club’s parent organization, the National Brotherhood of Skiers, didn’t take them seriously. They just couldn’t produce many young winter athletes. Over the decades, however, it was the club’s strong social and professional network that kept it together. The new president, Marc Hepburn, a commercial airline pilot, is organizing happy hours and monthly meetings at Champps. He plans to start sponsoring youth ski trips again and has been working with a friend at Microsoft to use Steep, a skiing and snowboarding video game, to entice potential young skiers. And then there’s the annual NBS Summit, which takes place March 2–9 in Steamboat Springs. More than 1,000 NBS members will attend, along with 30 or so Texas Ski Rangers from Dallas. Hepburn plans to be there, carving the black runs on his snowboard and catching up with friends and fraternity brothers.